Anna Cottrell and Jennifer Bush-Daumec (documentary makers) and David Underwood (business advisor) were the inaugural trustees of The Migrating Kitchen Trust, a not-for-profit charitable trust. In 2010 they were joined on the board by Dr Judith Aitken. In 2011 accountant Hui-Ping Wu joined the Trust and in 2012 Lobat Parsi became a trustee. Jennifer, Judith and David have now left the board and Mabel Makombore and Rob Hole have joined. The Trust arose from the successful exhibition that was held at Pataka Museum of Arts and Cultures in Porirua New Zealand-Aotearoa in 2007. 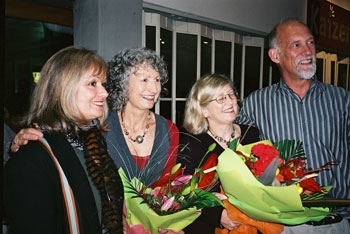 While the Trust has the moral support of the New Zealand Office of Ethnic Affairs and The Human Rights Commission, funding is raised through donations, grants and sponsorship. To encourage and provide opportunities for people in Aotearoa New Zealand to showcase their culture, to celebrate their history and to share their stories in exhibitions, media and public events so that through knowledge, barriers are broken, tolerance and understanding emerge. To promote public education programmes in Aotearoa New Zealand through partnership with ethnic communities living here, in order to celebrate racial diversity, promote tolerance and understanding, and to foster peace through showcasing culture, festivals, families and food. Sponsorship and funders welcome. We look forward to hearing from you.